Jetbull is a big, brash and highly effective gaming company who are operated by EveryMatrix N.V. who are based in Curacao in the Netherlands Antilles. They offer the whole gamut of gaming options, including sportsbook, casino – including a live casino – and bingo products. Jetbull is best known for its sportsbook, which is provided by OddsMatrix who are based in Malta and regulated and licensed by the Lotteries and Gaming Authority there. 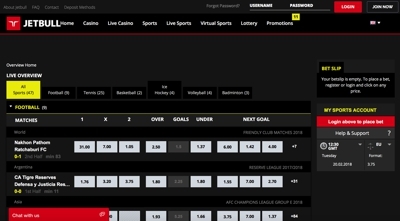 It presents an impressive range of sports betting markets and a user interface that is as clear and concise as any out there. They also offer an effective in-play betting provision for those who want to get right into the action. Jetbull’s casino is also very impressive. 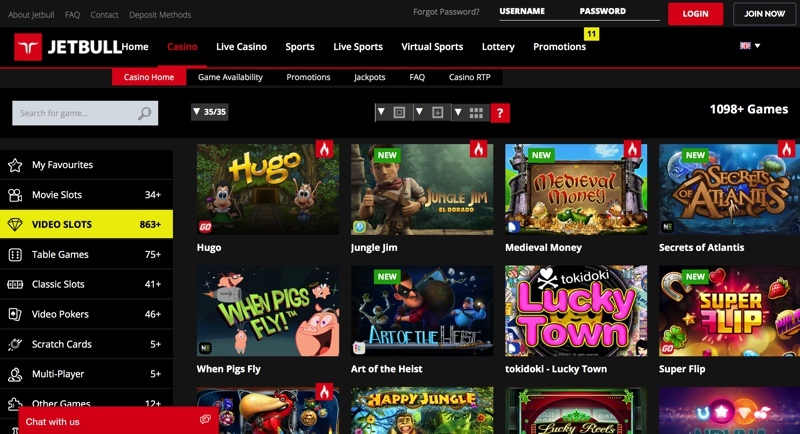 Utilising software from some of the biggest and best casino providers around – including NetEnt, Microgaming and Betsoft – Jetbull offer more than 700 games in every category you could hope for. If table games are you’re thing, you won’t be disappointed, and – along with video poker, scratch cards and classic slots, they have a vast array (almost 400) of video slots with excellent graphics and gameplay and many including the chance to win some truly massive jackpots. The recent addition of a bingo product to their gaming armoury will be welcomed by many, and while it is still in the relatively early stages of development, we fully expect it to expand swiftly and become a worthy competitor of some of the more established bingo sites out there. One of the big pluses of Jetbull is that their sportsbook and many of their casino games are also available to access on your mobile device, so you get the benefits of Jetbull’s fine products while out and about. Add to that the excellent customer service provision – including a live chat facility that is available 24/7 – and Jetbull are a well-organised, highly polished gaming outfit who have a great deal to offer. The sports book has been an area of the site that has continued to grow over the years. They include a really solid range of sports and what’s more impressive is their live betting section, which again, is very comprehensive. We liked the fact that Jetbull had a rather large emphasis on American sports such as American Football, Basketball, Ice Hockey and Baseball giving it more of an international feel for UK based punters. Microgaming powers Jetbull’s casino and, as a result, you can pick from a huge back catalogue of games. In fact, the site currently states that they have over 740 commissioned games in play, with almost 500 of those being video slots. The recent introduction of their mobile casino allows you to play all these games from the dedicated Jetbull mobile casino app.